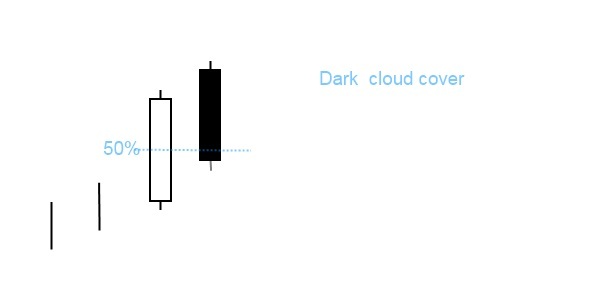 The dark cloud cover pattern consists of two candlesticks; the first is white and the second black. Both candlesticks should have large bodies and the shadows are usually small or don’t exist. The black candlestick must open above the previous close and close below the midpoint of the white candlestick’s body. It’s important that the penetration of second day’s close should be at least 50% into the range of the previous day’s white real body. What is the significance of dark cloud cover? The name “dark cloud” refers to a possible threat for the prevailing trend. The dark cloud patter is a top reversal pattern that forms in an uptrend and forecasts a potential weakness in the uptrend. It becomes more remarkable if the two candlesticks that form the pattern are marubozu candlesticks with no upper or lower shadows. Counter part of the dark cloud cover candlestick pattern is bullish reversal pattern called piercing pattern.